« Where is Orly Taitz’s Naturalization Certificate? Ironically enough I was intending to post this slate mailer over the weekend, but due to a press release just issued by the Orange County Professional Firefighters Association I couldn’t wait until tomorrow to post this. 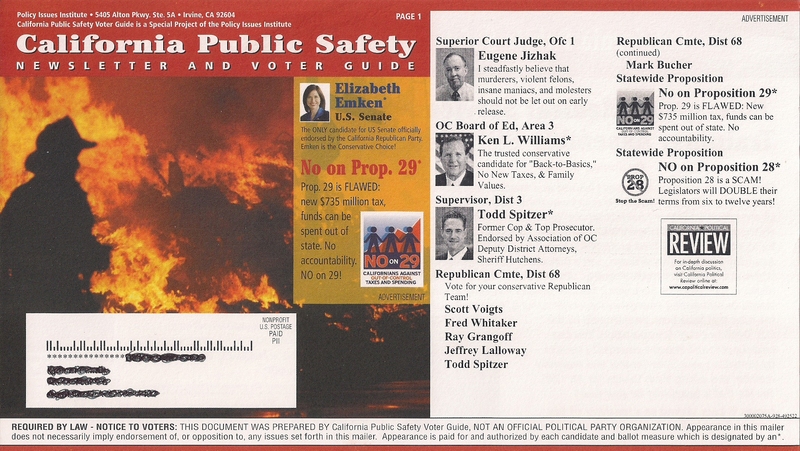 In my mailbox this week I received the California Public Safety Voter Guide. It was another well done slate from Landslide Communications and Jim Lacy. It appears that the Orange County Professional Firefighters Association is not that thrilled to see the use of a firefighter on the front of the piece. 1. Support funding to keep current staffing levels at John Wayne Airport, as well as the OCFA Handcrew Program that is slated to be curtailed at the end of current calendar year. 2. Support the 36 firefighter positions that were recommended but never adopted by the OCFA’s After Action report after the devastating firestorms of 2007 and 2008. The Orange County Professional Firefighters Association is an issue based organization that enthusiastically accepts support from individuals regardless of their political affiliation. We are hopeful this mailer signals real support among conservatives in Orange County – and not just political posturing — and that we will be able to count on them to help advance our goals of improving the public safety of all Orange County citizens. 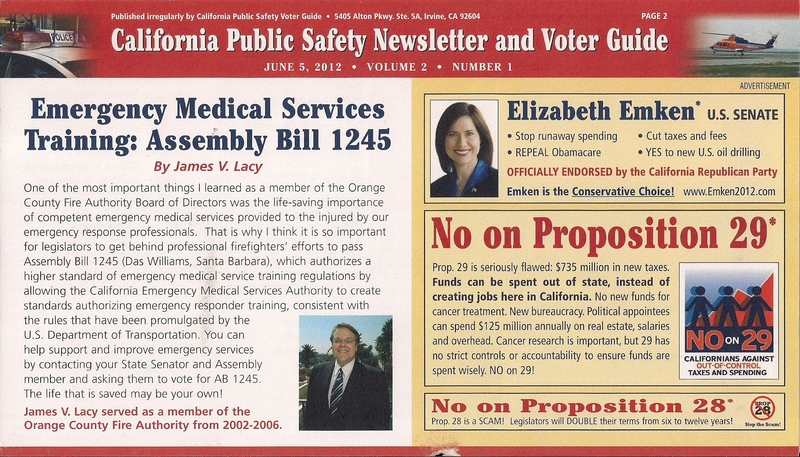 This entry was posted on June 1, 2012 at 5:42 PM	and is filed under Mail, Orange County Fire Authority. You can follow any responses to this entry through the RSS 2.0 feed. You can leave a response, or trackback from your own site. I think it is a stretch to suggest Jon Fleischman is a prominent “conservative” individual. :-) The labor union doesn’t realize that Fleischman is supporting RINOs like Rep. John Campbell.